3 years & up. Table features a 9" deep plastic tub with a unique drain and a two-piece top that hooks on the side for easy storage. 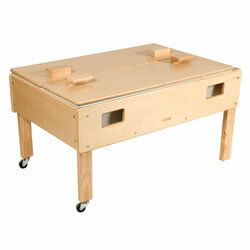 Includes handles on each end and heavy-duty casters on all four legs for easy mobility. 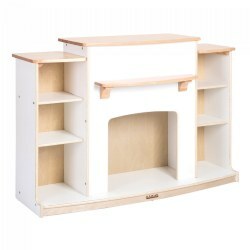 Birch frame and top. Measures 24"H x 45"L x 28"D. Minor assembly required. Indoor use only. 12 months & up. 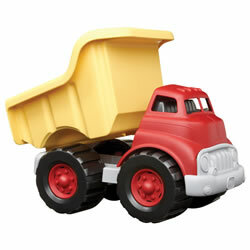 Tough and durable, this dump truck is 100% made from recycled milk cartons. The eco design features a workable dumper and no metal axles to rust. 10 1/2"L x 7 1/2"H. Made in the USA. 3 years & up. A great sensory alternative to sand, oatmeal, or rice! 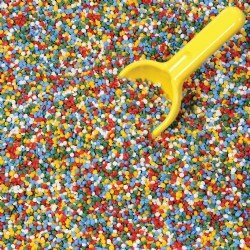 These colorful polypropylene plastic pellets are non-allergenic. 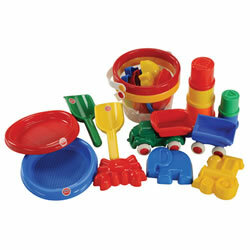 Floats in water for sand and water table fun. Works well in art projects too! Scoop® not included. Scoop®, dig, and move sand with ease! 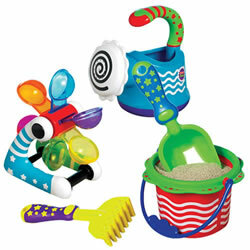 Brightly colored, easy to grip, plastic sand tools. 7 1/8"L x 4 7/8"W.
18 months & up. 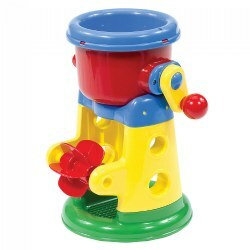 Colorful graphics and sized just right for toddlers, this set of sand and water toys include a bucket, scoop®, rake, easy to fill and pour watering can and carousel style water wheel. Colors may vary. 18 months & up. Add extra fun to sand play with this plastic sand mill that turns, sifts, and tumbles the sand down its interesting path. 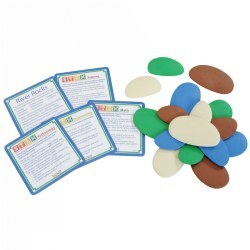 Measures 9 1/2"H x 7"W.
These soft chunky foam shapes are easy to pick up and great for spelling or counting. 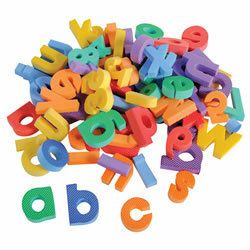 Letters are approximately 1.5" - 2" in height. Set includes 84 pieces. 19 months & up. This kit is designed to support sand and water exploration with enough items for up to 8 children to dump, sift, explore, and experiment with sand and water. The storage container is included for easy clean-up. 3 years & up. 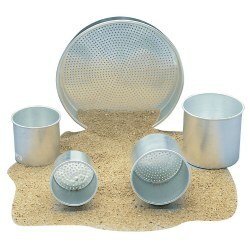 Rust-proof aluminum set includes nine inch pan sifter, four nesting cans with two perforated bottoms and three scoops. The scoops have 3 inch handles and extra wide scoops. 3 years & up. 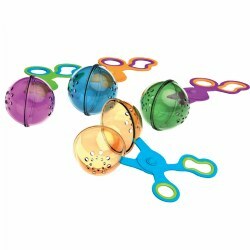 Fun scissor action scoops for playing catch and release activities in the water table. Features translucent scoops with easy-grip handles. Great for building fine motor skills and strengthening hand motions needed for scissor skills. 3 years & up. 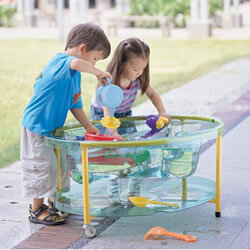 Children will experience water play through various types of water play tools. Includes two watering cans, three pipettes, one water wheel, two spray bottles, two pump bottles, and two funnels. 18 months & up. 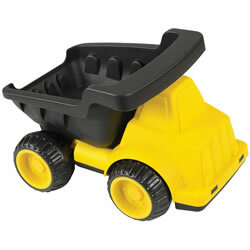 When a big job is needed, call in this heavy duty working dump truck! 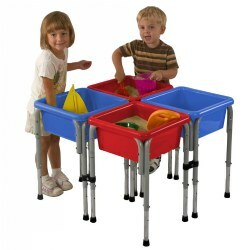 Durable plastic body along with silent wheels makes perfect for indoor or outdoor play. The wheels leave real tracks in the sand as children haul off construction debris. Colors may vary. 3 years & up. Combine art with water play with these fun bath time soap crayons. Children can draw on the bathtub and surrounding shower walls while they get clean. Crayon easily wipes off all bath surfaces with a wet cloth. 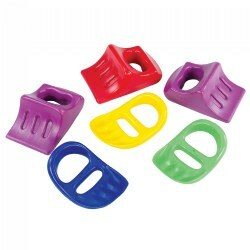 Includes: Foam holder with 6 soap crayons (red, yellow, blue, green, purple, and orange). 18 months & up (with adult supervision).This sand is a non-toxic, white, play sand that is great for indoor or outdoor use. It is environmentally friendly and contains no silica or quartz. It is 100% natural, molds great when moist and has a soft and pleasant texture when touched. 25 lbs. Shells not included. 12 months & up. 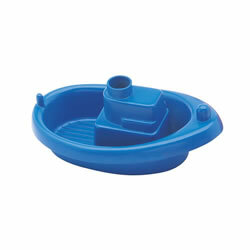 Brightly colored plastic boat floats and brings endless fun to water play. Boat will nest inside of another tugboat and they can also link together emphasizing sequencing. Colors will vary. One tugboat. 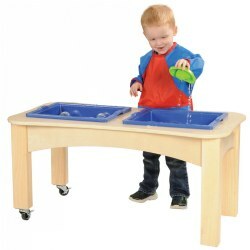 Boat is completely dishwasher safe and has no sharp edges, making it a wonderful addition to any classroom. 3 years & up. 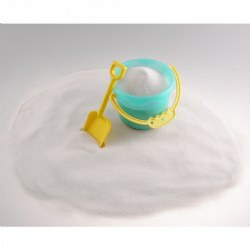 Add interest to your sand table with this blue dust-free play sand. Non-toxic with a smooth sugary soft feel and washed and "painted" with an non-toxic color dispersion. Color will not fade or bleed. Clean and non-irritating. 20 lb. bag. Made in the USA. Little explorers will sift through the play area with this durable, rust-proof aluminum set. 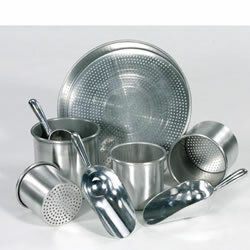 Includes 9" pan sifter and 4 nesting cans, 2 with perforated bottoms. Sensory Mat 45" x 58"
Keep the mess of sand and water from off the floor. This mat is made of a soft absorbent 100% polyester fabric that will absorb spills. Sand and water is trapped between the fabric and the bonded backing to prevent soak through. Non-slid backing also provides a firm footing. 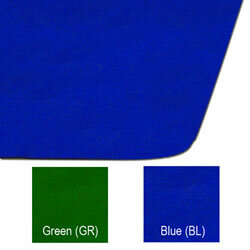 The mat is stain resistant, dries quickly and machine washable and dryable. 3 years & up. 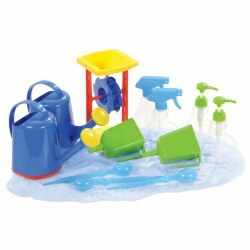 This durable, plastic play set includes a rake, 2 scoops, watering can, bucket, sand mill and to top it off a water pump which allows children to see the process of water moving up the shaft and out the spout. Sand not included.